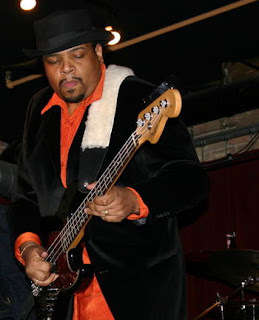 the total scene: Chicago musician Chip Ratliff takes funk, soul to new heights on new album, "Resilient"
Chicago musician Chip Ratliff takes funk, soul to new heights on new album, "Resilient"
Chicago musician Chip Ratliff is dedicated to taking funk and soul to new heights. He takes another step in that direction on his new album "Resilient," his first full-length album in more than 10 years. He will celebrate the release of the album by performing at 7 p.m. Aug. 26 at Shorefront Legacy Center, 2214 Ridge Ave., Evanston. There is a $20 donation. Q – Great talking to you. "Resilient" is your first full-length album release in more than 10 years. Have you been writing these songs for a while? Was this just the right time to release a new CD? Thank you for having me! A lot of the tunes on “Resilient” are songs that have been in the hopper for a while. A couple are brand new. For instance, the dance tune “DirtyBlu” was actually the first song I wrote after Prince’s death. It was the first groove I played when I picked up my bass. After going through a lot of challenges the past few years, I really felt that it was time to share my gifts and make sure I leave some kind of legacy. I really felt it was time to put something out that reflected my love of funk and my blues roots. Q – Do you see the album as a natural progression from your last album, "Electric Chittlin' Stew"? Not so much a natural progression from the last album, but more of a natural progression for me personally and as an artist. When I did “Electric Chittlin’ Stew” I felt the need to be everything to everybody, which is why it has such a broad range of material: funk, R&B, rock, Santana style Latin-rock… a little bit of everything, like a stew! “Resilient,” on the other hand, is more of me having a great time being me! I wanted to put together an album that if you came out to a Chip Ratliff show, this is what you would hear. Q – What would you like people to get out of the album? I understand that the album's title refers to overcoming any obstacles and challenges in one's way. Have you had to do that in your own musical career? I’m hoping that it not only entertains, but also inspires. [I hope that it] inspires people to keep moving forward, regardless of the obstacles that are in front of them. Q - You come from a musically rich family, including being the cousin of Chicago blues singer and guitarist Lefty Dizz (I watched a YouTube video of one of his shows at the Checkerboard Lounge and he put on quite an energetic show), along with the fact that your grandfather, Herman Ratliff Sr., played guitar in Memphis clubs with legends B.B. King and Muddy Waters in the 1940s. Was it inevitable that you would become a musician? What kind of support did you get from your family? Yeah, entertainment is definitely in my DNA! I’ve actually been entertaining all my life, in one way or another. I was the kid who would get up at the drop of a dime and do my spot-on Michael Jackson or Elvis (yes…I was an Elvis fanatic!) impersonation for the entire family...or whoever wanted to watch! I actually call myself the first Michael Jackson impersonator! But as for my family, yes, music and entertainers were all around me. My uncle Fernando (Jones) and I would play our instruments (me on bass, him on guitar) in his mom’s (my grandmother’s) living room all day on Sunday afternoons! His brother, my other uncle Greg, would teach us songs that he liked. Then we would play them all afternoon! The only reason that no one stopped us was because we sounded pretty good! So, yeah, it was pretty inevitable. Q - You shared the stage with Lefty, along with your uncle, Fernando Jones, Buddy Guy, Willie Dixon and others. What did you learn from playing with musicians of this caliber? What advice did they give you? Playing with those guys allowed me to sit at the feet of some of the greatest musicians and performers of all time and learn! I learned about showmanship, timing and, most of all, TO BE YOURSELF! One of the best pieces of advice I got was from Fernando. He said, in so many words, that the way you make people remember you is to be yourself. Be genuine. Q - I understand you wrote your first song when you were 5, a duet with Jones (who was 6 at the time) called "Get Out Of Here." Does writing songs come easy for you? One thing I’ve found is that you constantly have to keep practicing and honing your craft. I always say that songwriters “tune in” to the gazillions of songs that are out there in the air. Not everyone can hear them…but they’re there. Now…I don’t mean to be all deep, but the more you stay in tune, the less difficult it becomes to channel the songs. Q – You are president of the board of directors for Shorefront. Is it an honor to be associated with such an organization? It is an amazing honor to be the President of the Shorefront. Shorefront is a non-profit organization that collects, preserves, and educates about Black history on Chicago’s suburban Northshore. I have learned so much about Black history in general, and the importance of preserving heritage and using it as a foundation to move our community into the future. The Chicago music scene is not as open to new, original music as I and others would like for it to be. Even with that said, it is a major city, and it affords opportunities to create your own opportunities. That’s what I’m trying to do…not just sit and wait for things to happen. Make them happen! Create opportunities for myself and others! Q – What is on your plate for the rest of the year? Well, more live performances to celebrate the release of the new album. I’m looking to get my music heard by as many people, not only locally but nationally and internationally, [as possible]. I’m also looking to my move forward with the “Practice Your Purpose™” initiative. The mission is to inspire the global audience to find and practice their purpose on a daily basis.